Happy 4th of July! Hope you guys had a great long weekend to celebrate the holiday. With the summer heat arriving, I'll be showing you some ways to stay cool and look sharp to fight against the heat. First up of the Summer Suede Style series is, of course, The Suit. 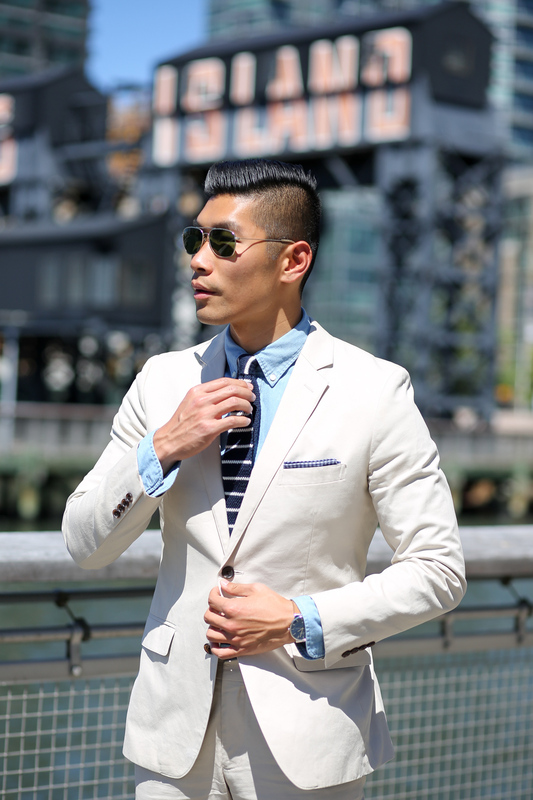 A cotton suit is a great option to have for the summer because the material is lighter and breathable. It doubles as office style and a wedding suit so can't really beat that type of versatility in menswear! I love the beige or light grey color options since it's subtle for the office and goes with my skin color better. I went with a striped knit tie and gingham pocket square for a little pattern mix combo. Extra tip: Unbutton the shirt sleeve for more air circulation to cool you off. The overall look is kept minimal, sharp and clean - exactly the blueprint for summer style. 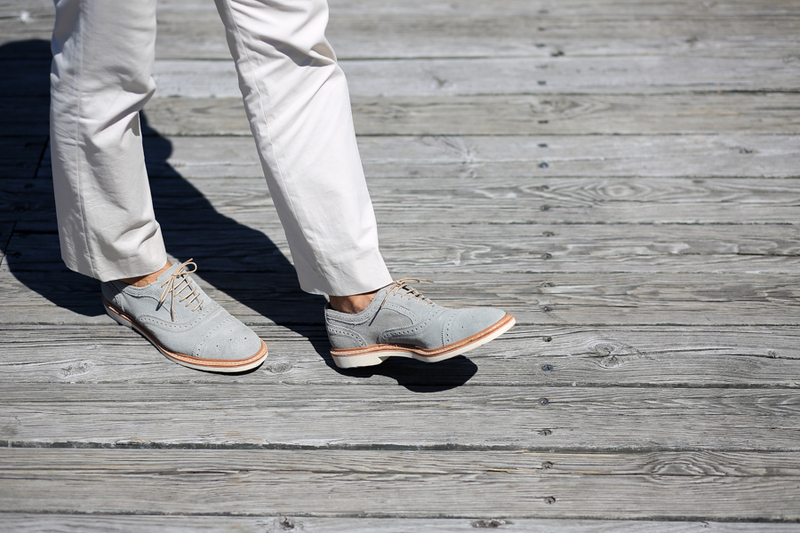 I'm a big fan of suede shoes especially in the summertime and I'm excited to show off a few different summer suede shoes from Allen Edmonds in this series. AE has always been one of my favorite shoemakers since college. I remembered researching what dress shoes to get for the corporate world and AE was always mentioned in every article. I love the brand's long history, great styles and the type of quality that will last a lifetime. Funny enough my first pair is the Walnut brown Strands and now I'm rocking a summer suede edition of the shoes in the Strandmok. 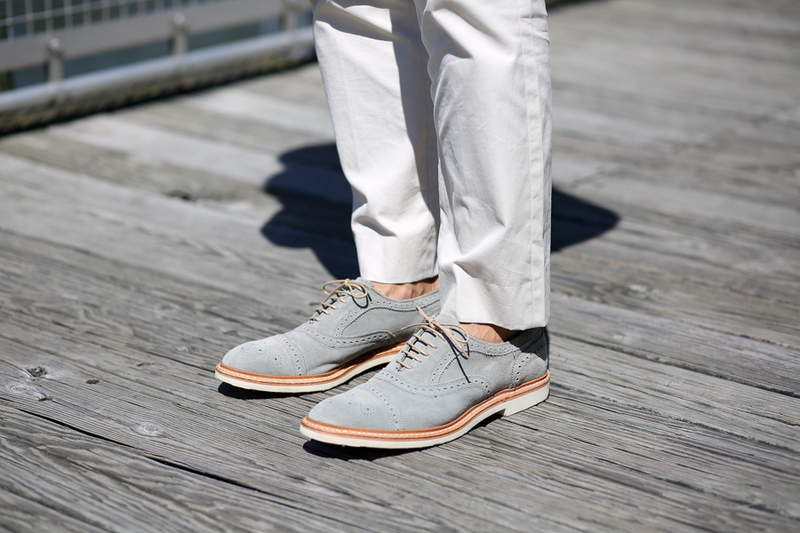 The light grey Strandmok 2.0 is perfect to go with a light suit, jeans, or chinos. The shoes also feature vibram soles for added comfort to last all day walking. Stay tuned for Parts II & III in the Summer Suede Series! Drop a comment on your thoughts of this look below! Well done with the denim shirt and striped knit tie! 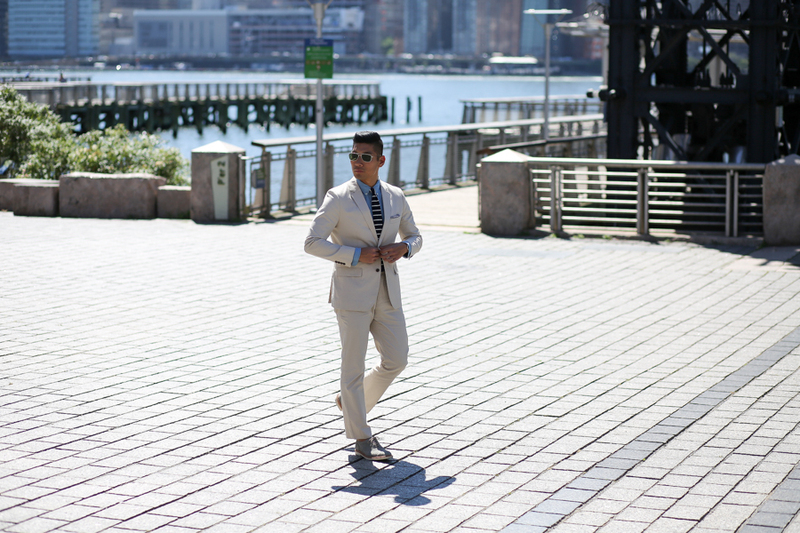 This is the epitome of styling a summer suit. Loved the style, the tie specially.